Basketball is an integral part of Chicago culture. From the concrete-laden playground courts to the ingenious milk crate-turned-basketball rim in the alley, the sport’s rich history is synonymous with Black Chicago’s identity. So when the powers that be swoop in and switch up our beloved tradition at the high-school level, where our homegrown talent starts to come into their individual stardom, it’s bound to be met with opposition from some of Chicago’s hoops stalwarts – the coaches. In the midst of the 2016-17 season, the Chicago Public Schools’ Office of Sports Administration announced profound changes to the boys’ basketball conferences for the 17-18 season. The biggest change is a total realignment of teams, switching from the previous four-conference Red layout to two ten-team “super conferences,” the Red South-Central and Red North-West. With this change, teams weren’t able to move up or down in conferences based on their records from the 2016-17 season. The administration temporarily suspended promotion and relegation for the 17-18 season until further notice. It also affects one of the most thrilling elements of Chicago high-school hoops – rivalry games. For example: Simeon and Morgan Park, two of the South Side’s most storied adversaries, will no longer play each other twice a season. Although subtle, this erases the popular adage for rivals getting even with each other during the season and reduces the hype for rematches. Lastly, the change disrupts the competitive balance. A belief amongst Public League coaches is that administrators created the “super conferences” format to level the playing field to distribute top programs throughout divisions, spreading contention. 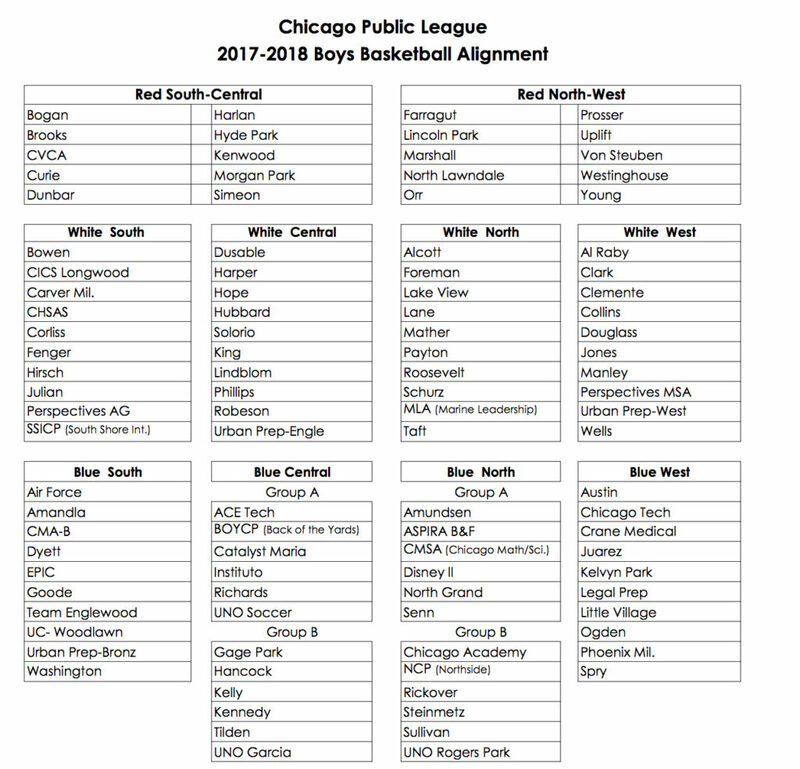 However, they still ended up lumping top programs such as Curie, Orr, Morgan Park, Whitney Young and Uplift into the Red South-Central and Red North-West divisions. Each of those teams won a state title at least once in the last four seasons. The TRiiBE sat down with coaches from Morgan Park, Roberto Clemente, Westinghouse and Crane to get their thoughts on the new “super conferences.” They offered unique perspectives from the position of their student-athletes as well as what it means for the future of Chicago high-school basketball.